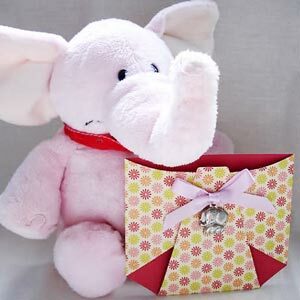 Looking for homemade toddler toys to make for your little one? 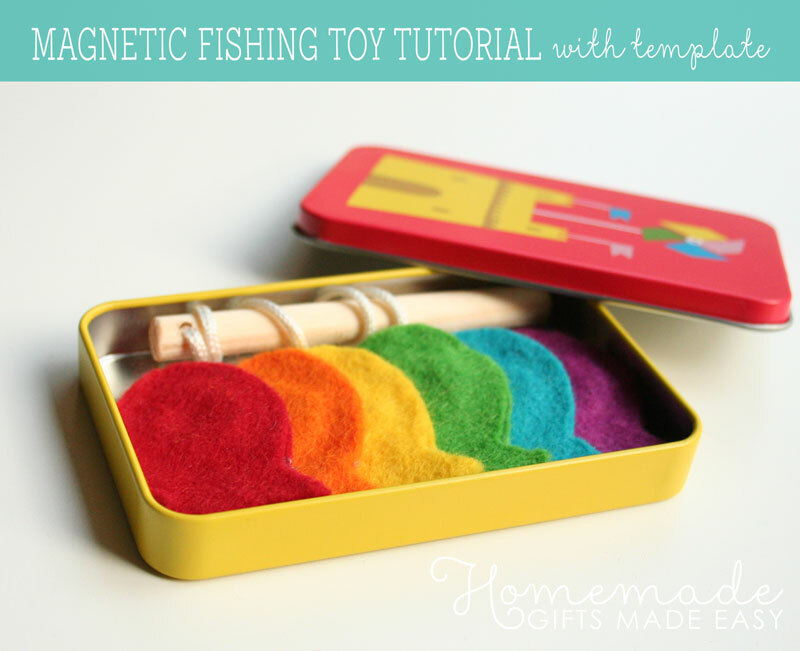 This magnetic fishing game is simple to sew and will provide endless hours of creative play. The free printable template makes it easy to assemble, and it is a great gift idea for both little boys and girls. There is something endlessly fascinating about magnets. As a child it seemed almost magical to me that two things could attract each other like metal does to a magnet. So what better way to start your little one's introduction to physics than with this toy! 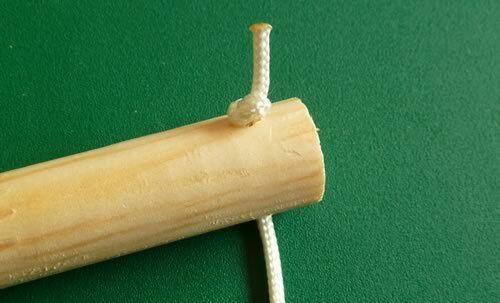 There are many tutorials for various versions of this homemade toddler toy on the web. 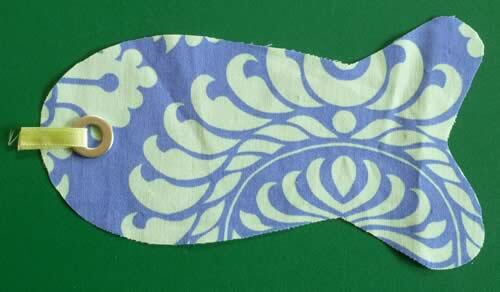 You can make simple cardboard cutouts of fish with metal paperclips attached, or fish made out of felt and fabric. I wanted to make a gift for a three year old boy and thought that the fabric fish was a sturdier option for him (plus I had some really pretty fabric I wanted to use!). 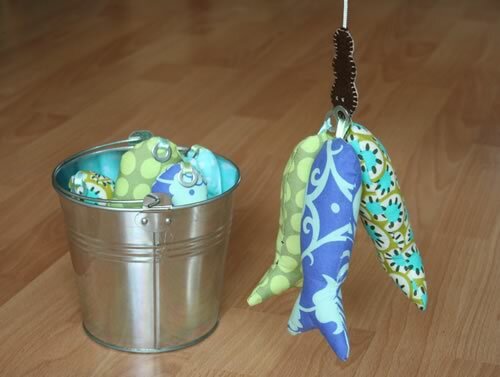 I also wanted to make a fish where the metal washer was on the outside of the fish to make them easier to "catch" with the magnet, and I came up with my own method of attaching them using satin ribbon which I think looks great and is really secure too (good if there are littler babies around the house). Since writing this page, I then made the easy felt fish version with my Mother's group. 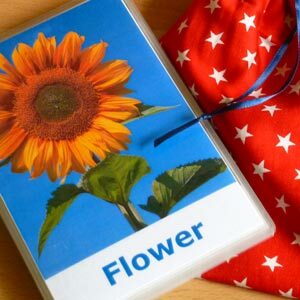 I usually lead a craft each term, and it has to be something quick and simple we can make while our children are in creche. This craft was a success and all the little fishies looked so sweet. Check it out below if you're looking for a super quick homemade toddler toy! 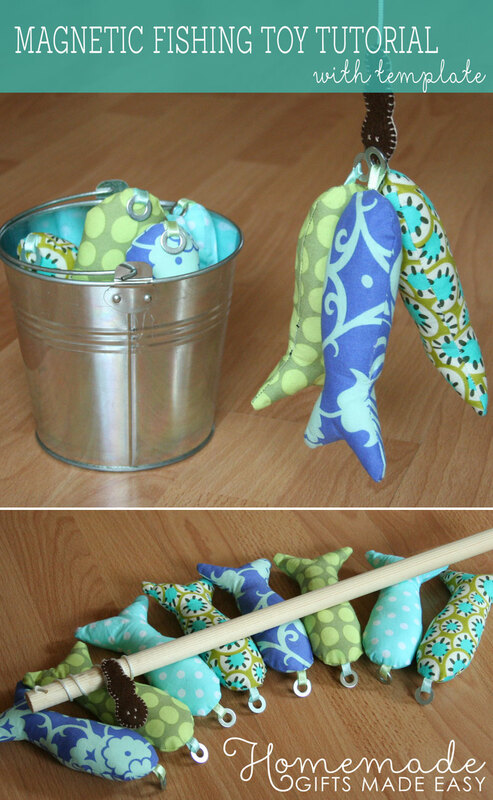 This homemade toddler toy comprises of some (metallic) fabric fishies and a fishing rod with a magnetic worm on the end. You can make as many fishes as you like. For the fishing line you could also use shoe lace instead of thin rope. I used two disc shaped magnets each 15 mm x 1 mm (9/16" x 3/64") that I bought on eBay, which was the cheapest place I found. I got a pack of 20 for about $6. 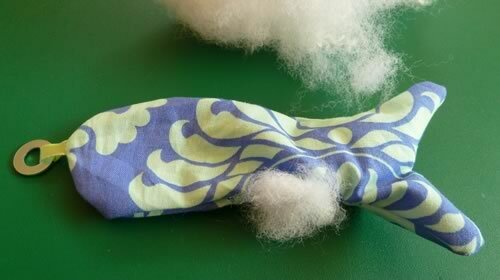 Thread the metal washer through a small piece of ribbon and place it at the head-end of the fish. 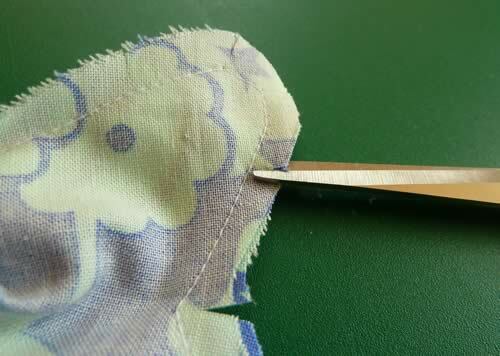 Now lay the second piece of fabric on top of the first, so that the printed sides are facing inwards. 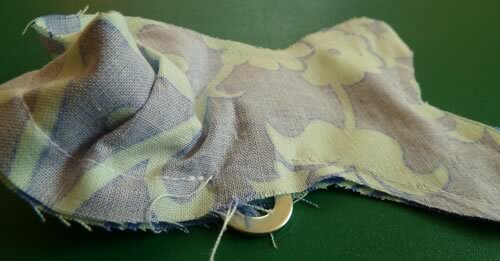 Pin the fabric in place, including the ribbon which holds the washer in place. 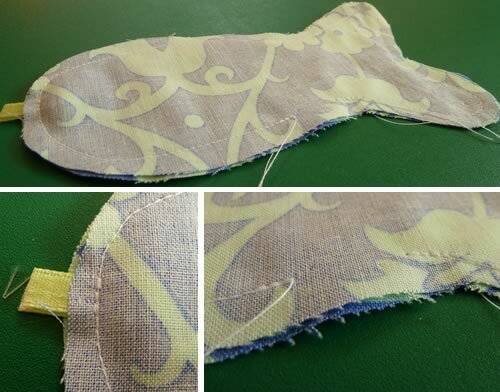 Sew the fish together using a simple straight stitch leaving about 1/3" margin. At the end, make sure you leave about an inch gap so that you can stuff the fish later. Backstitch over the region where the ribbon attaches to the fish just to make sure the washer is very securely attached. If you want you can snip little cuts around the periphery of your fish to help prevent bunching of the fabric once it is turned out. (I actually forgot to do this with some of my fish and they looked fine). Turn your fish pattern-side out. The easiest way to do this is to feed the metal washer through the gap first, and then the rest of the fabric will follow quite easily. Use a pointy object to help you poke the tail the right way out. Stuff the fish with toy-filler so that it is nice and plump. You might need to use a pointy object to help you to push the filling into the tail. 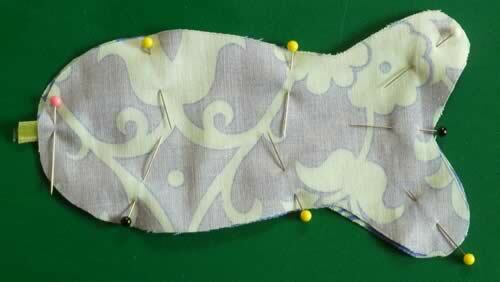 Then hand-sew the open seam together to complete your fish. 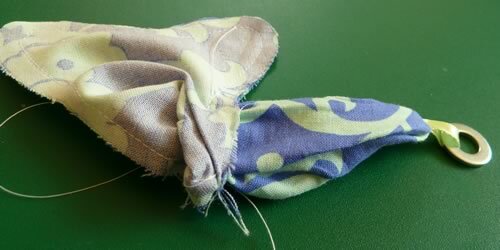 I used ladder stitch to close the seam as it provides an almost invisible stitch and is great for closing up soft toys. See the video below (which isn't mine) for a demonstration of ladder stitch if you're not familiar with it. And here is the finished fish - so cute! 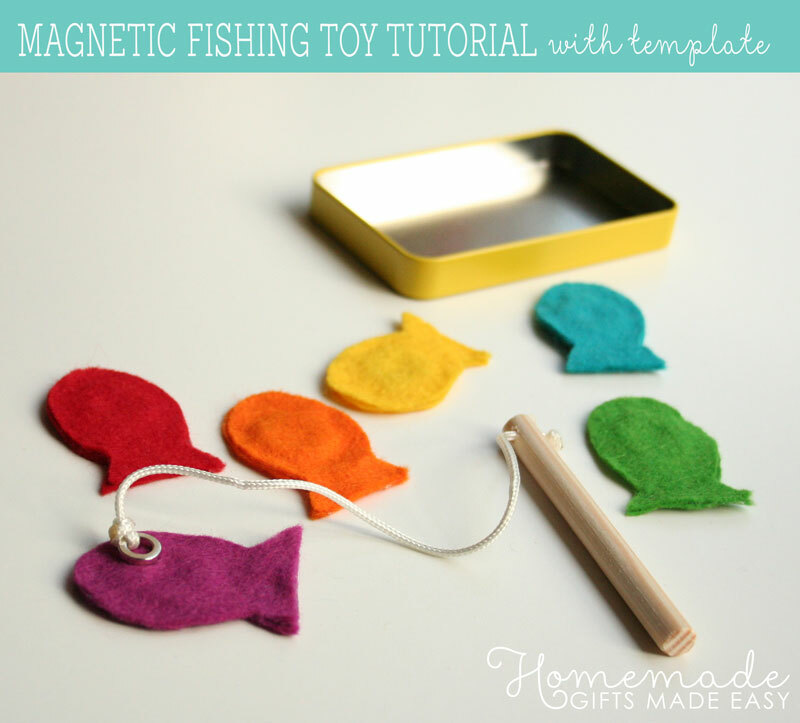 It is up to you how many fish you'd like to include in your homemade toddler toys. 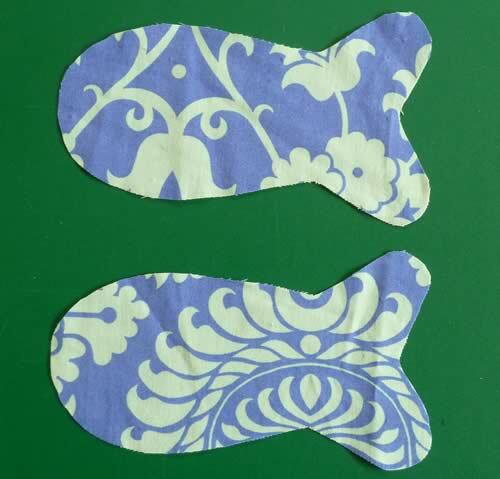 For this project I have made a school of eight fish, making two fish out of each fabric. 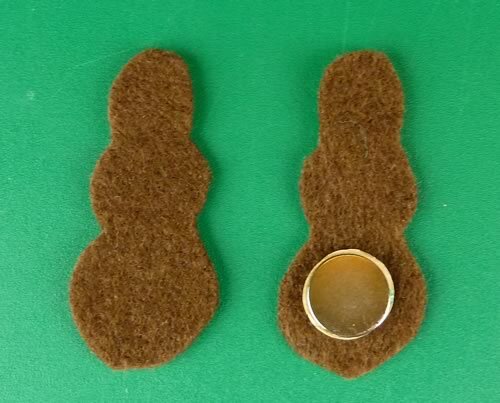 Gather your materials to make the felt worm. 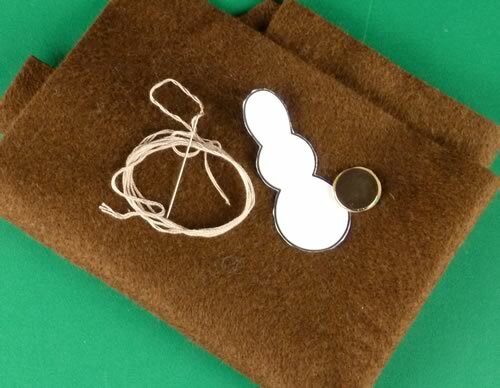 You'll need the worm template , felt, embroidery floss and magnets. I used two magnets to make sure my worm was super-magnetic! Cut out two pieces of felt using the template. Make sure your magnet fits in the head-region of the worm, leaving a margin around. You might need to alter the template depending upon the size of your magnets. At this stage you can embroider a small face onto one of the pieces of felt if you like. 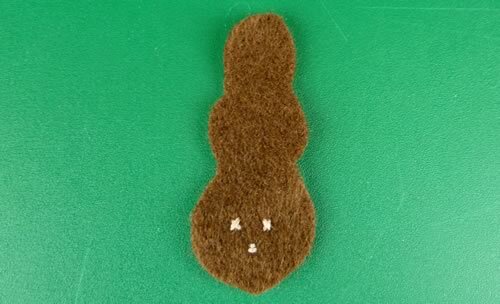 Starting in the narrower tail region of the worm, use blanket stitch to sew the two pieces of felt together. 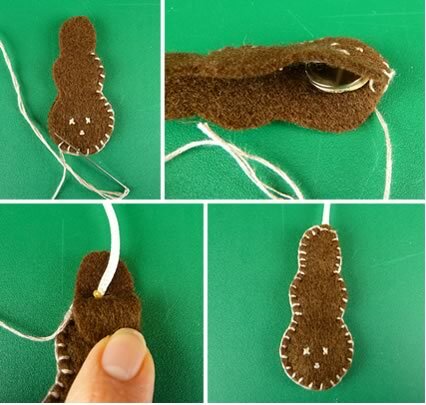 Once your worm is half sewn, slide the magnets into the head region and then continue to sew the pieces together. Once you have almost sewn your worm together, place one end of your string into the tail region of the worm. Sew through the string to secure it in place. 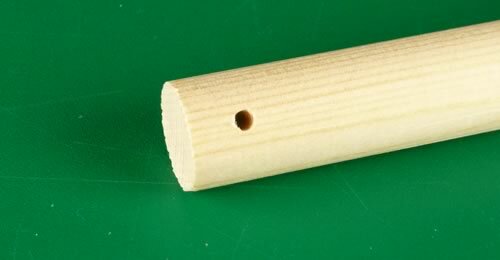 Drill a small hole in the end of your piece of dowel. Feed the other end of your string through this hole (you might need to use something pointy to help push the string through), and then tie a simple knot in the end of the string to secure the rope in place. It is possible that you might need to shorten the string depending upon the height of the toddler playing with it. To do so simply pull up some slack through the hole and re-tie a knot. Here are a couple of pictures of the completed homemade toddler toy. I made it for a friend of mine's son, but I think I might have to make a set for my son too as he was very interested in it and enjoyed walking around holding the bucket over his shoulder! I bought a small metal bucket to store the fishies in, and the rod can stand up in it too so it all packs away together. Now it is just time to go fishing! I really hope you enjoyed my homemade toddler toy tutorial and that your little toddler enjoys playing with it too! 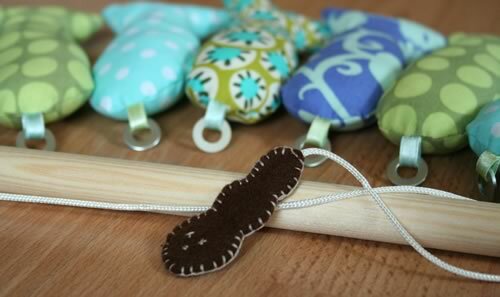 Looking for a quicker homemade toddler toy? 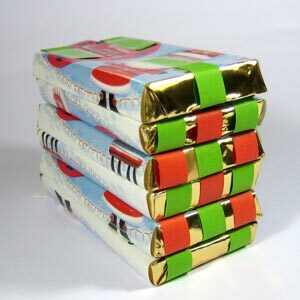 Here's a no-sew mini fishing game that fits in a candy tin (e.g. Altoids tin). Each fish is made from two pieces of felt hot glued together with a metal washer sandwiched in the middle. It's super easy to make. If you'd like to have a go at making one, then why not download my fish template then head over to Natalie's full instructions at Doodlecraft . I pretty much followed her method but I only used one 3/4" washer per fish.